So, Was there ever life on Mars? Without a human geologist roaming the surface, hammer in hand, it’s devilishly difficult to find out, and current robotic explorers aren’t really built to answer that question. But, just weeks after NASA’s Curiosity rover detected spikes of methane in the Martian atmosphere — possible evidence of biological activity — a prominent geobiologist says she sees possible signs of past life in photos of the Martian landscape taken by the rover. 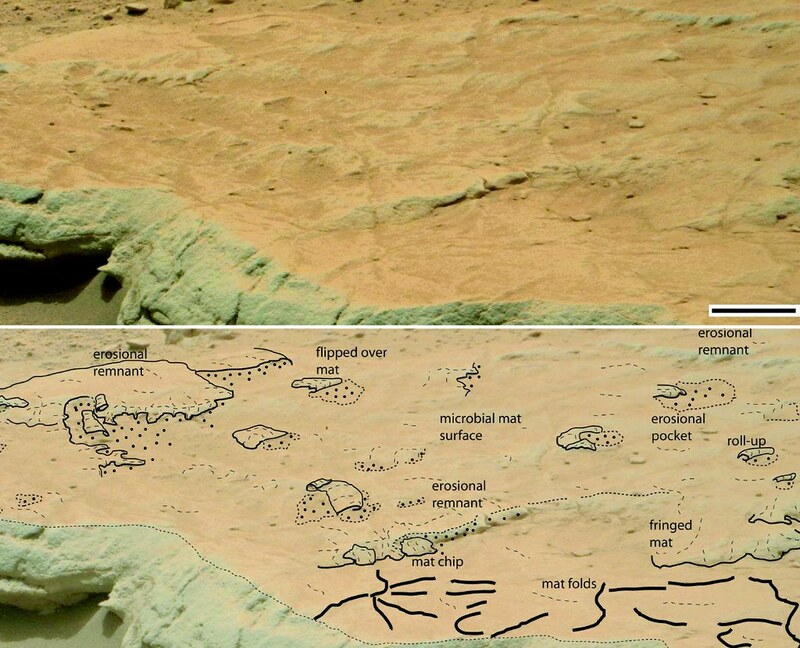 Curiosity spotted patterns in rocks on the Martian surface which resemble those created by microbes here on Earth. The images were recorded in rocks from an ancient lake bed inside Gale Crater, where the spacecraft has spent much of its time since landing. Looking at the overlay sketch above, Noffke documented various sedimentary features, such as an elevated planar surface (defined by a 3-4 cm “cliff” with triangle-shaped protrusions), flat clasts, several round-shaped depressions (many of which are surrounded by half-moon-shaped ridges), and larger lineations. These and other features, say Noffke, display a variety of sedimentary structures that have equivalent features to MISS that formed on Earth in similar environmental settings. “The rock bed surface on Mars displays two depressions associated with triangular structures and ridges; linear ripple-like features occur in the base of the larger depression. Terrestrial erosional pockets produced by erosion of a microbial mat–covered sedimentary surface in a modern setting. Note the elongated roll-up structure of the original microbial mat on the left side of the erosional pocket in the center of the photograph.” Noffke noted. Noffke – hopes others will test her hypothesis. The next time Curiosity comes across features like this, they would be a good candidate for drilling and analysis by the nuclear-powered rover’s on-board laboratory.